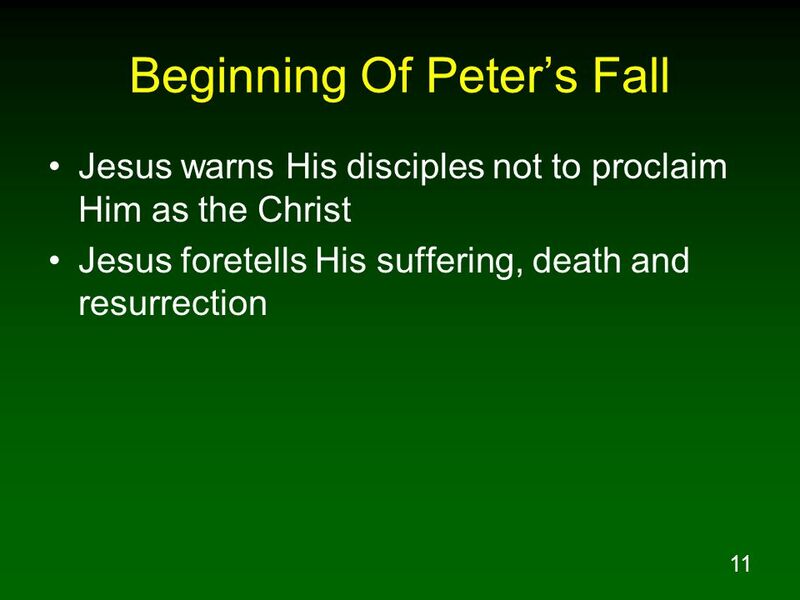 4 Introduction Mat 16:16 Simon Peter answered, "You are the Christ, the Son of the living God." Mar 14:71 But he began to curse and swear, "I do not know this man you are talking about!" 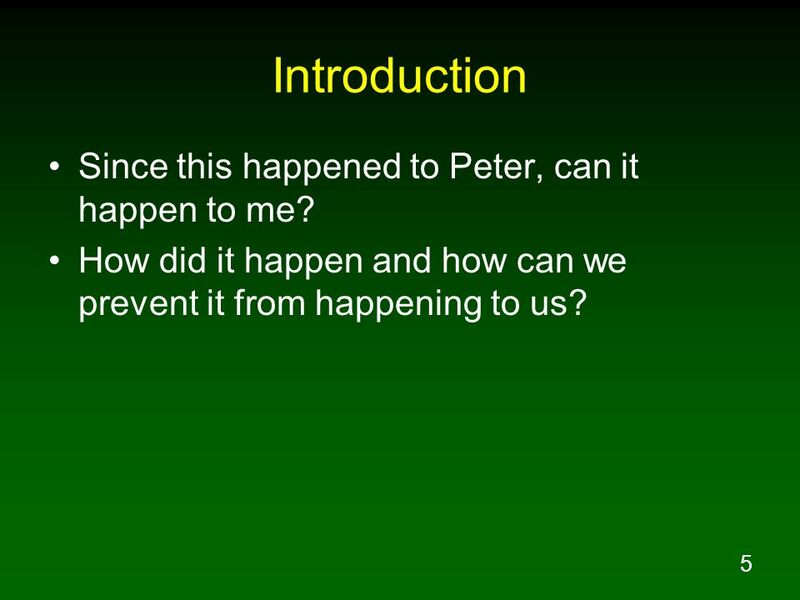 5 Introduction Since this happened to Peter, can it happen to me? How did it happen and how can we prevent it from happening to us? Mat 16:15 He *said to them, "But who do you say that I am?" Mat 16:16 Simon Peter answered, "You are the Christ, the Son of the living God." 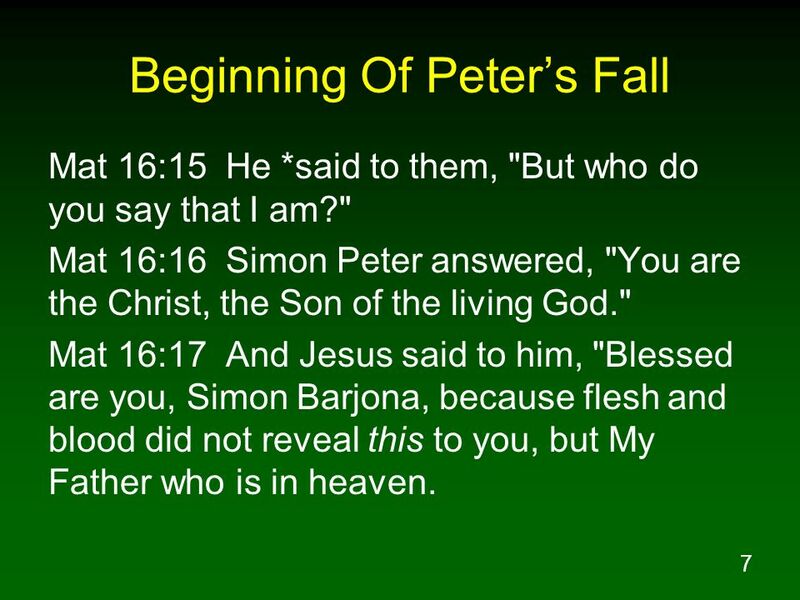 Mat 16:17 And Jesus said to him, "Blessed are you, Simon Barjona, because flesh and blood did not reveal this to you, but My Father who is in heaven. 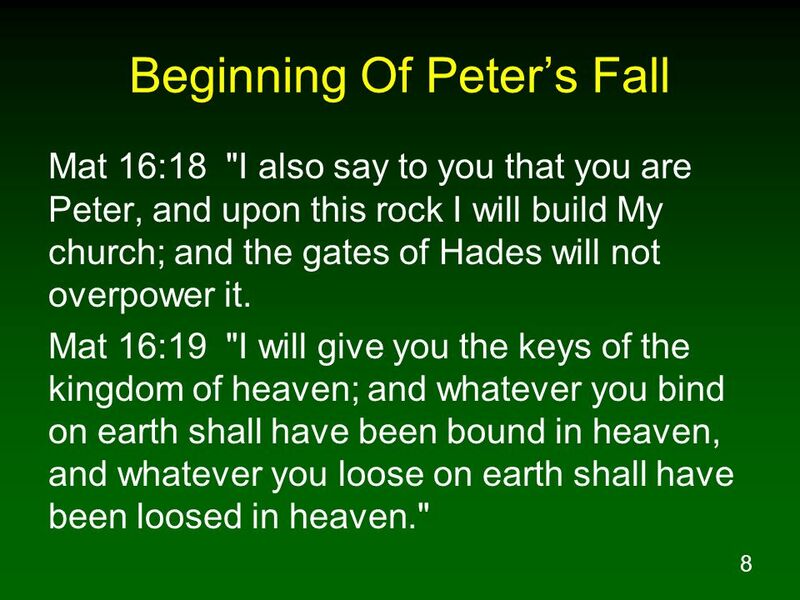 Mat 16:18 "I also say to you that you are Peter, and upon this rock I will build My church; and the gates of Hades will not overpower it. Mat 16:19 "I will give you the keys of the kingdom of heaven; and whatever you bind on earth shall have been bound in heaven, and whatever you loose on earth shall have been loosed in heaven." Mat 16:20 Then He warned the disciples that they should tell no one that He was the Christ. 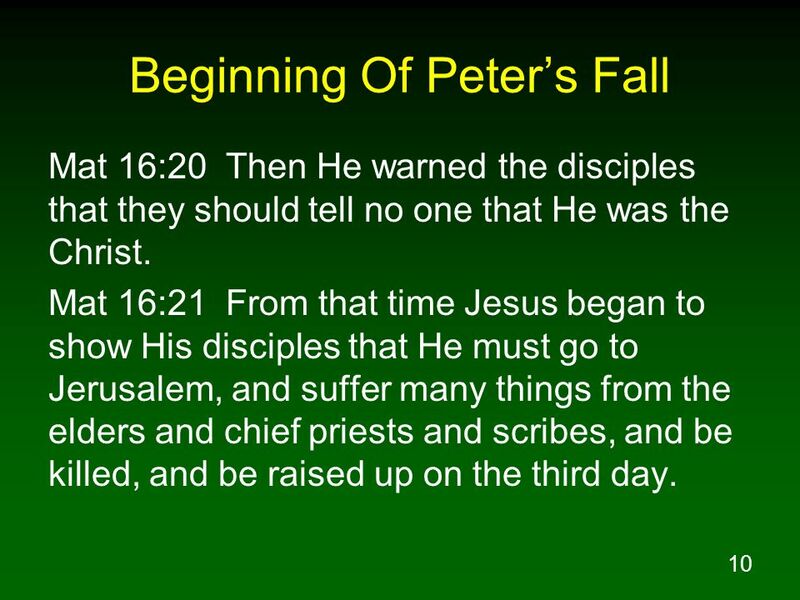 Mat 16:21 From that time Jesus began to show His disciples that He must go to Jerusalem, and suffer many things from the elders and chief priests and scribes, and be killed, and be raised up on the third day. Mat 16:22 Peter took Him aside and began to rebuke Him, saying, "God forbid it, Lord! This shall never happen to You." 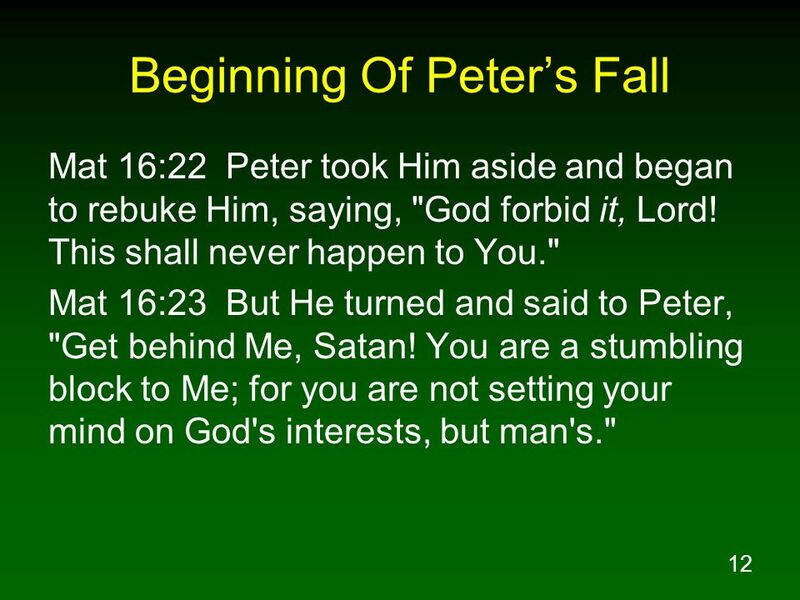 Mat 16:23 But He turned and said to Peter, "Get behind Me, Satan! You are a stumbling block to Me; for you are not setting your mind on God's interests, but man's." Mat 16:24 Then Jesus said to His disciples, "If anyone wishes to come after Me, he must deny himself, and take up his cross and follow Me. 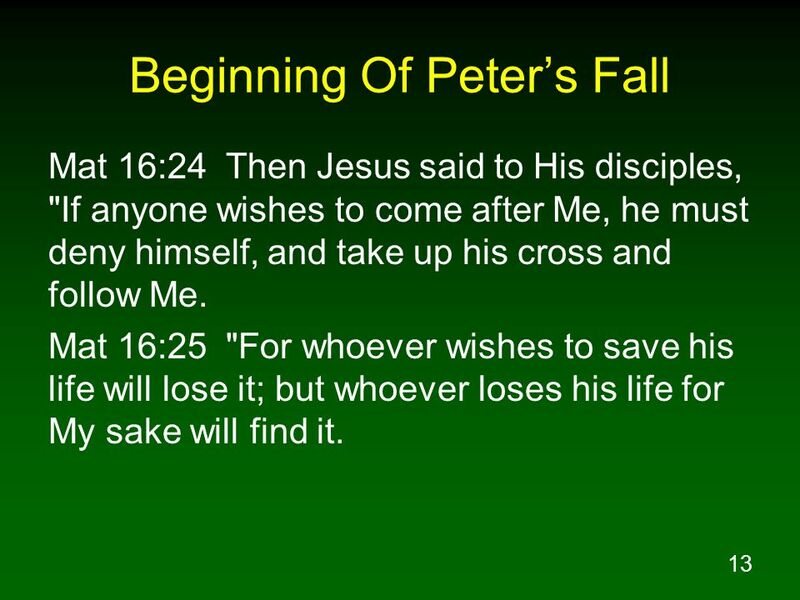 Mat 16:25 "For whoever wishes to save his life will lose it; but whoever loses his life for My sake will find it. 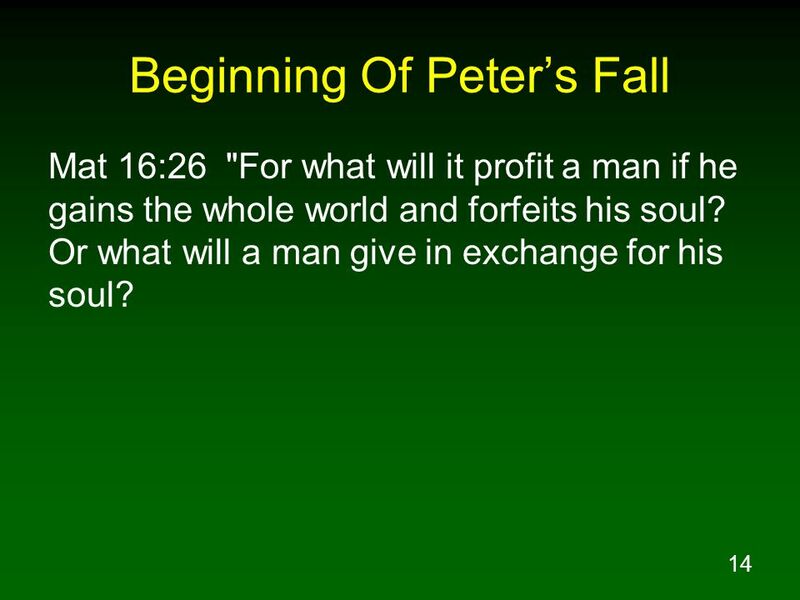 Mat 16:26 "For what will it profit a man if he gains the whole world and forfeits his soul? Or what will a man give in exchange for his soul? 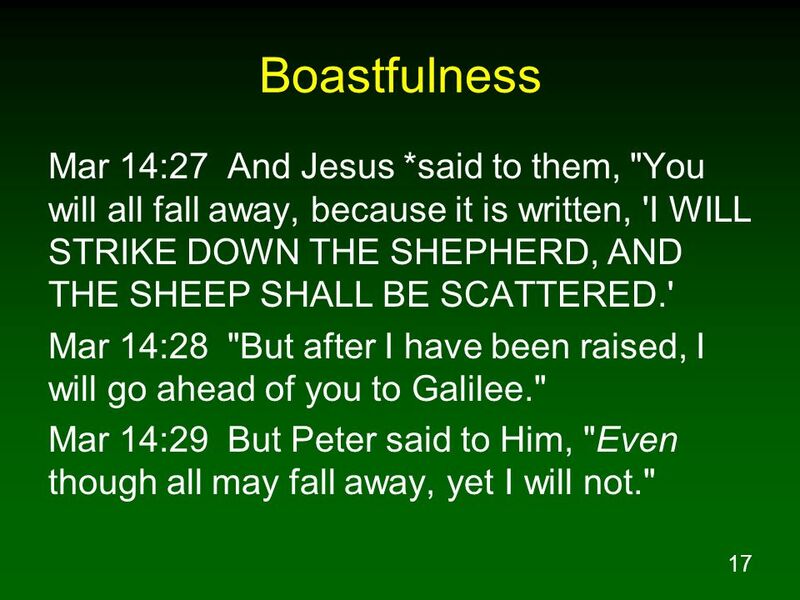 17 Boastfulness Mar 14:27 And Jesus *said to them, "You will all fall away, because it is written, 'I WILL STRIKE DOWN THE SHEPHERD, AND THE SHEEP SHALL BE SCATTERED.' Mar 14:28 "But after I have been raised, I will go ahead of you to Galilee." 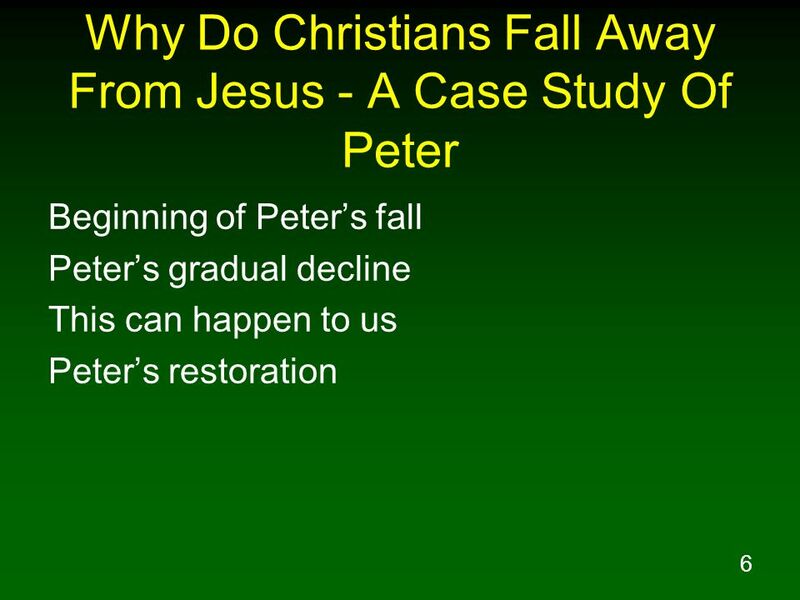 Mar 14:29 But Peter said to Him, "Even though all may fall away, yet I will not." 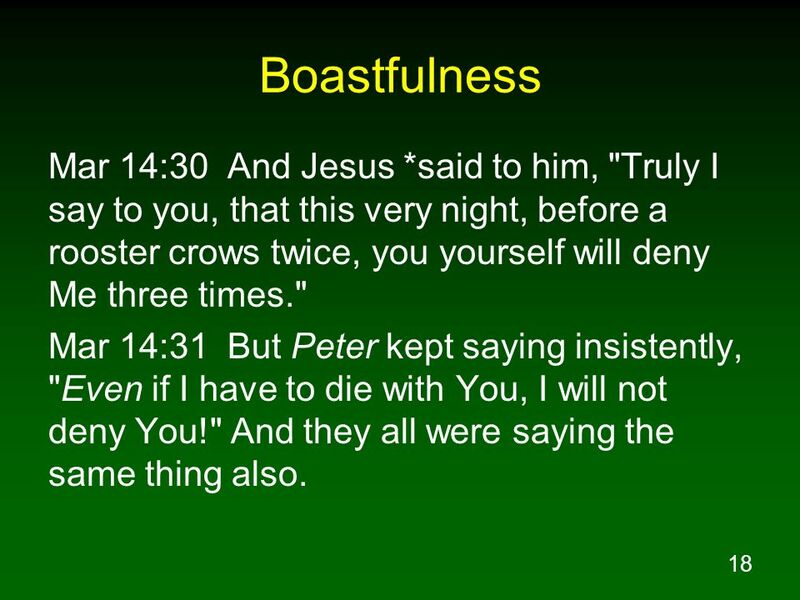 18 Boastfulness Mar 14:30 And Jesus *said to him, "Truly I say to you, that this very night, before a rooster crows twice, you yourself will deny Me three times." 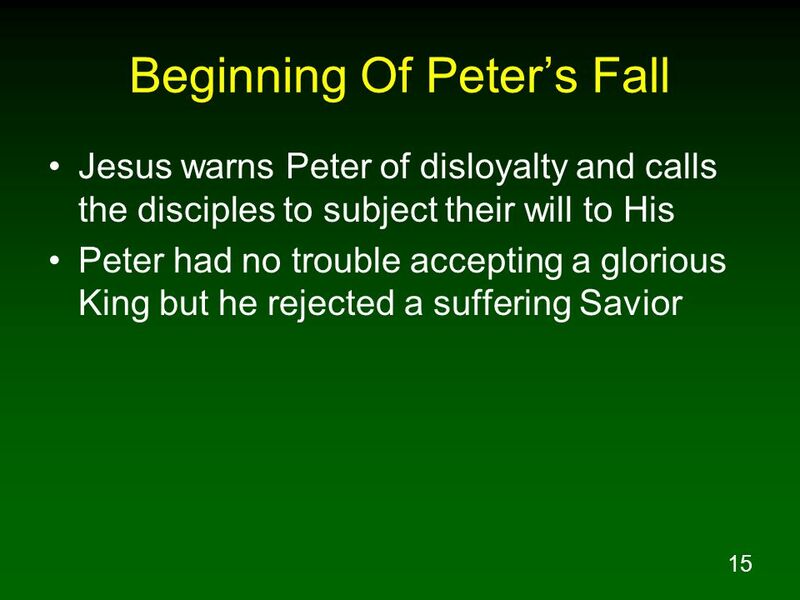 Mar 14:31 But Peter kept saying insistently, "Even if I have to die with You, I will not deny You!" And they all were saying the same thing also. 19 Prayerlessness Mar 14:37 And He *came and *found them sleeping, and *said to Peter, "Simon, are you asleep? Could you not keep watch for one hour? Mar 14:38 "Keep watching and praying that you may not come into temptation; the spirit is willing, but the flesh is weak." Mar 14:47 But one of those who stood by drew his sword, and struck the slave of the high priest and cut off his ear. 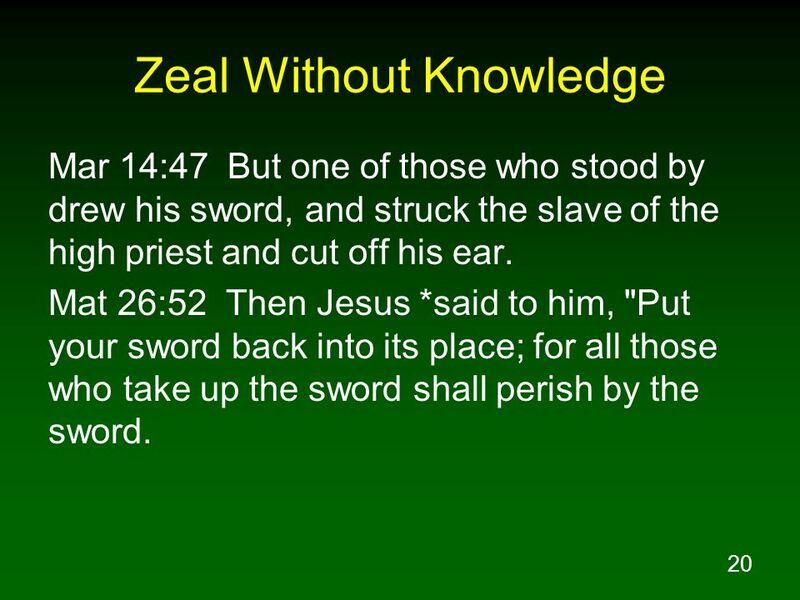 Mat 26:52 Then Jesus *said to him, "Put your sword back into its place; for all those who take up the sword shall perish by the sword. 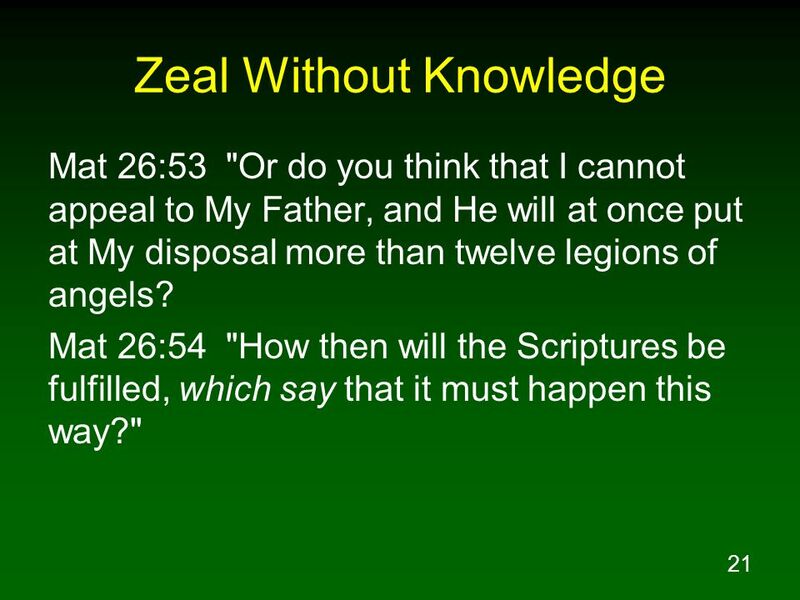 Mat 26:53 "Or do you think that I cannot appeal to My Father, and He will at once put at My disposal more than twelve legions of angels? Mat 26:54 "How then will the Scriptures be fulfilled, which say that it must happen this way?" 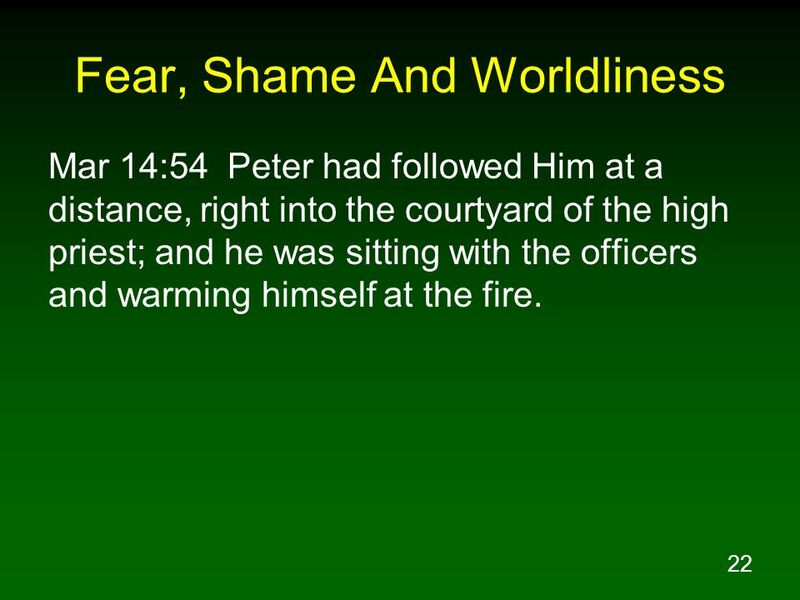 Mar 14:54 Peter had followed Him at a distance, right into the courtyard of the high priest; and he was sitting with the officers and warming himself at the fire. 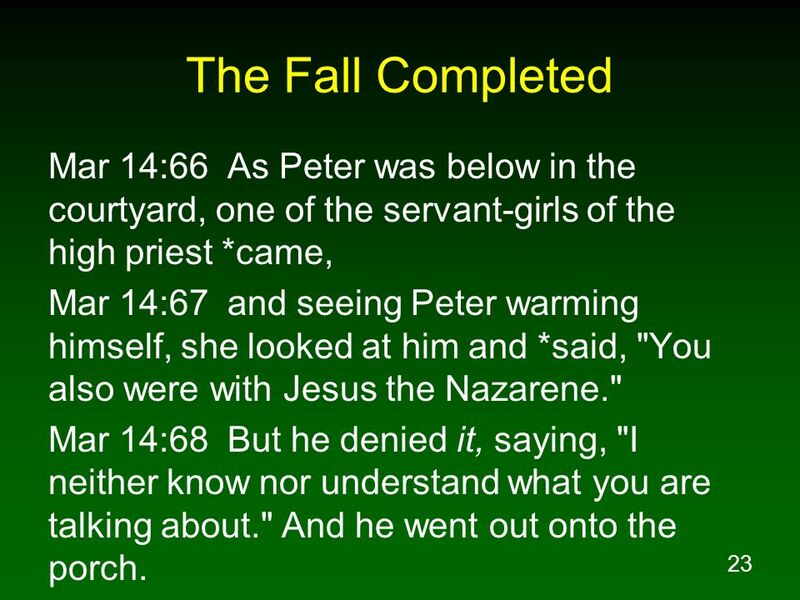 23 The Fall Completed Mar 14:66 As Peter was below in the courtyard, one of the servant-girls of the high priest *came, Mar 14:67 and seeing Peter warming himself, she looked at him and *said, "You also were with Jesus the Nazarene." Mar 14:68 But he denied it, saying, "I neither know nor understand what you are talking about." And he went out onto the porch. 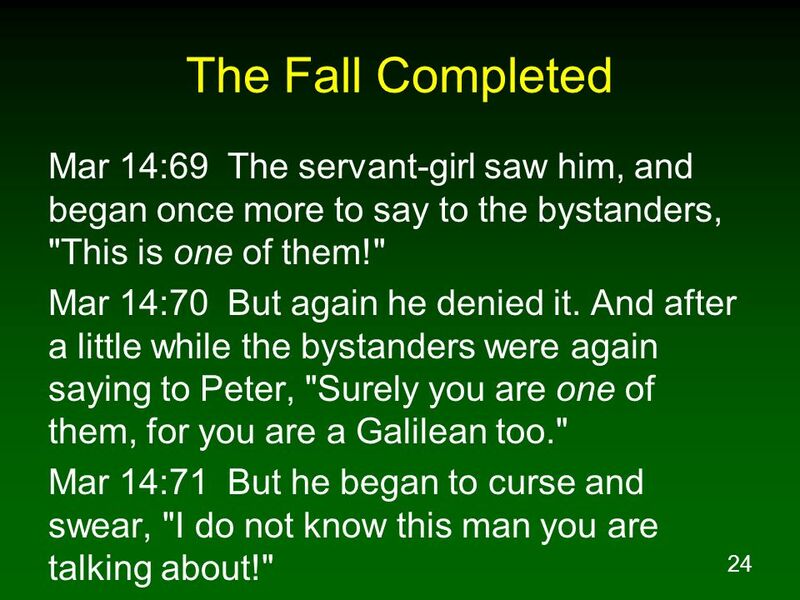 24 The Fall Completed Mar 14:69 The servant-girl saw him, and began once more to say to the bystanders, "This is one of them!" Mar 14:70 But again he denied it. 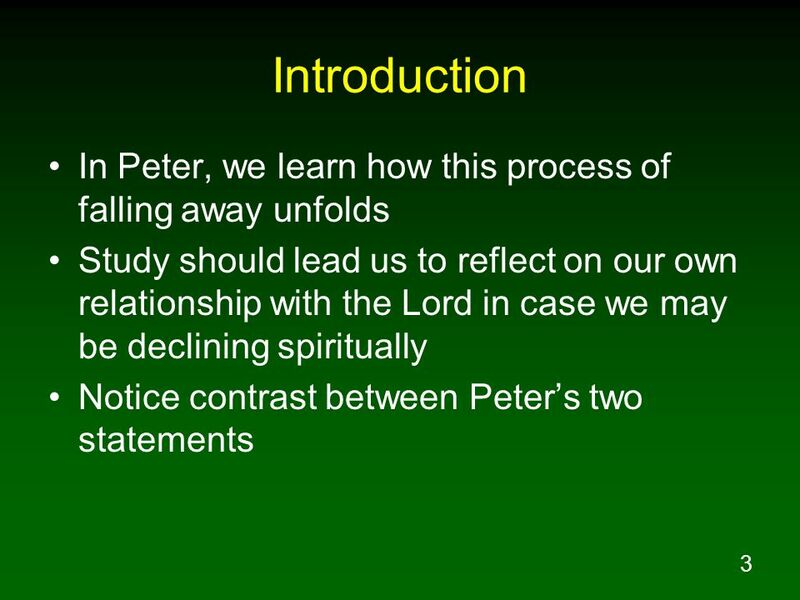 And after a little while the bystanders were again saying to Peter, "Surely you are one of them, for you are a Galilean too." 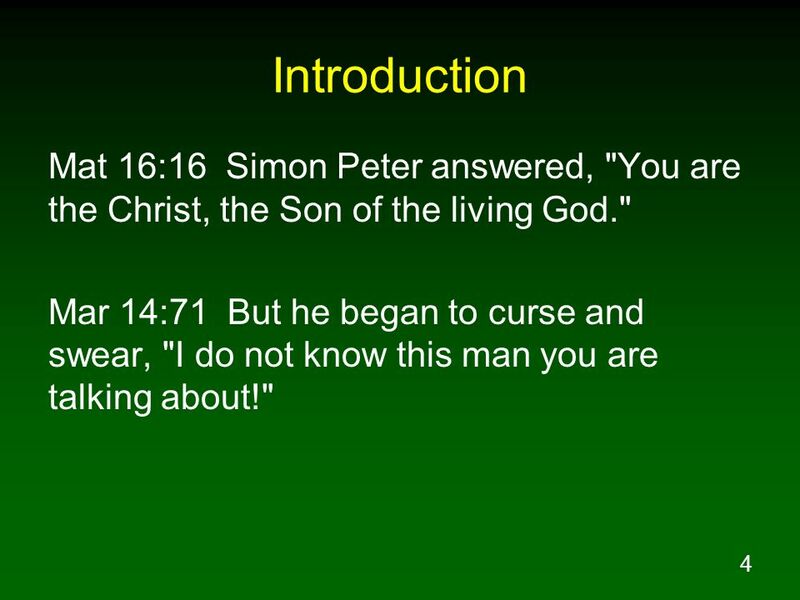 Mar 14:71 But he began to curse and swear, "I do not know this man you are talking about!" 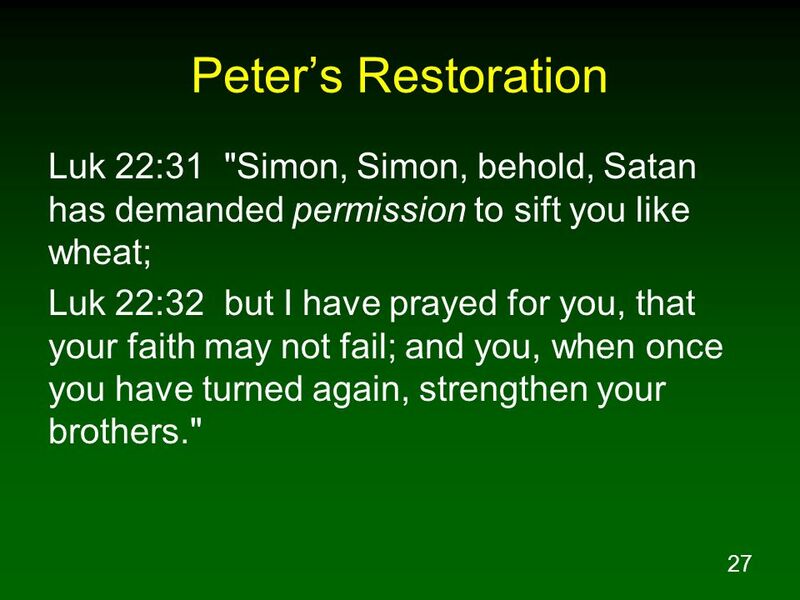 27 Peter’s Restoration Luk 22:31 "Simon, Simon, behold, Satan has demanded permission to sift you like wheat; Luk 22:32 but I have prayed for you, that your faith may not fail; and you, when once you have turned again, strengthen your brothers." 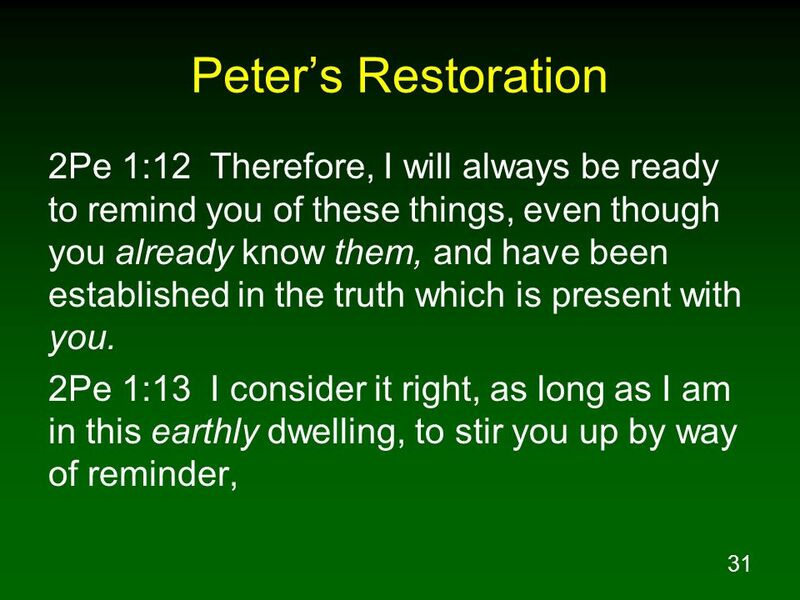 28 Peter’s Restoration Luk 22:33 But he said to Him, "Lord, with You I am ready to go both to prison and to death!" 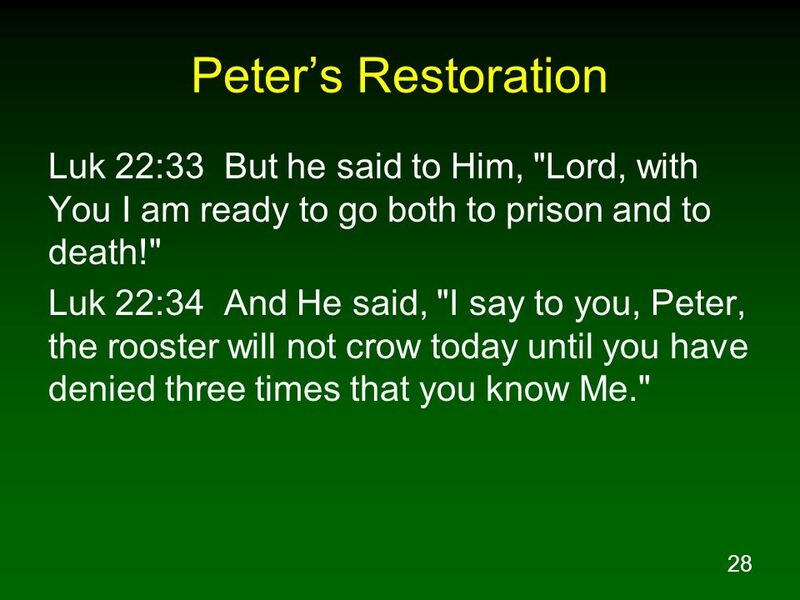 Luk 22:34 And He said, "I say to you, Peter, the rooster will not crow today until you have denied three times that you know Me." 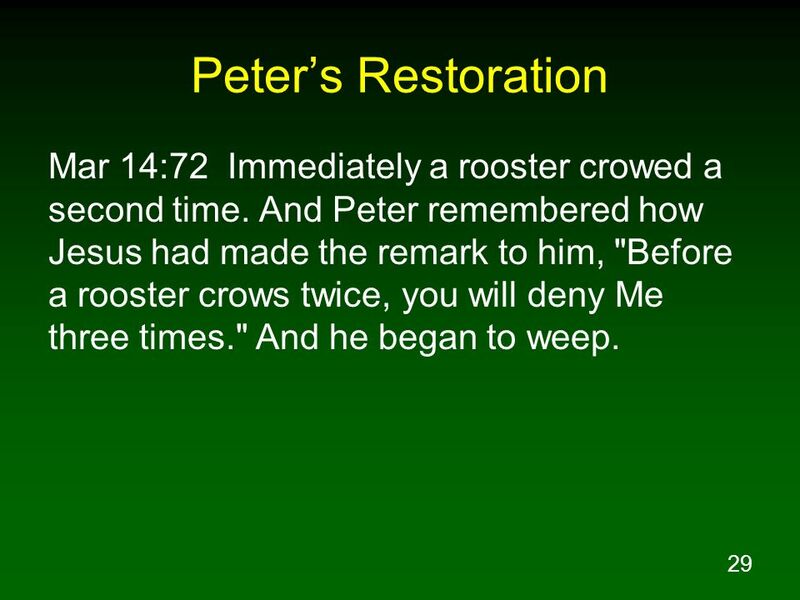 29 Peter’s Restoration Mar 14:72 Immediately a rooster crowed a second time. 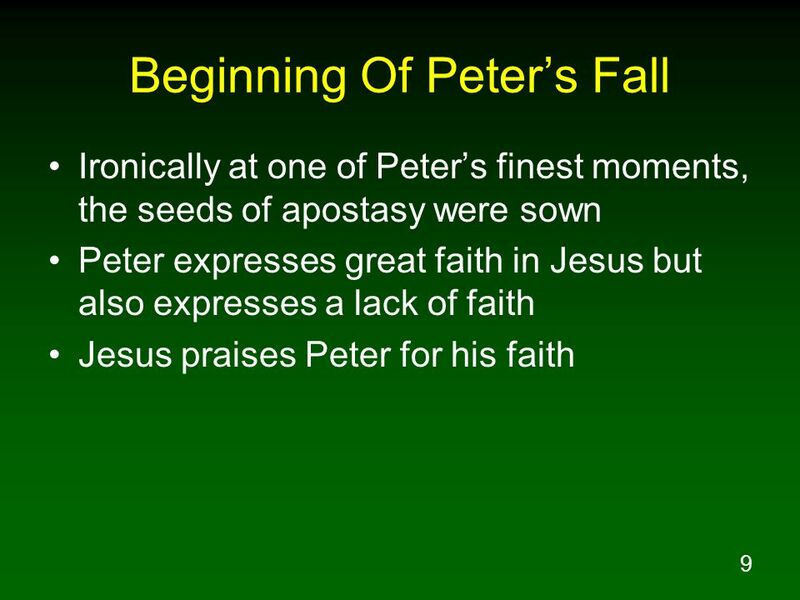 And Peter remembered how Jesus had made the remark to him, "Before a rooster crows twice, you will deny Me three times." And he began to weep. 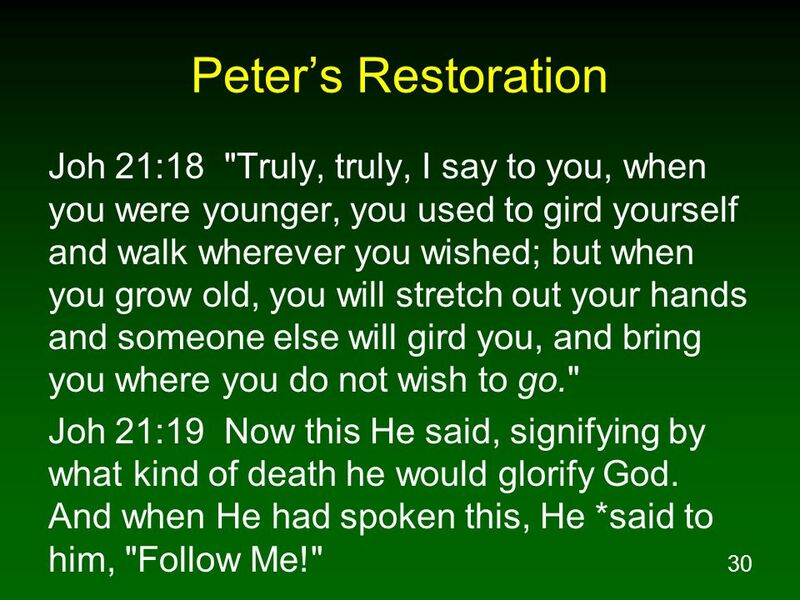 30 Peter’s Restoration Joh 21:18 "Truly, truly, I say to you, when you were younger, you used to gird yourself and walk wherever you wished; but when you grow old, you will stretch out your hands and someone else will gird you, and bring you where you do not wish to go." Joh 21:19 Now this He said, signifying by what kind of death he would glorify God. And when He had spoken this, He *said to him, "Follow Me!" 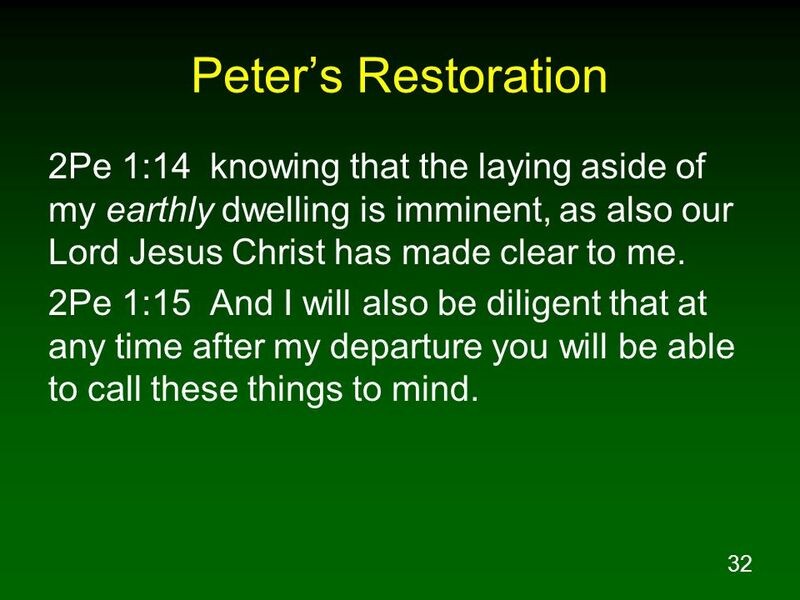 32 Peter’s Restoration 2Pe 1:14 knowing that the laying aside of my earthly dwelling is imminent, as also our Lord Jesus Christ has made clear to me. 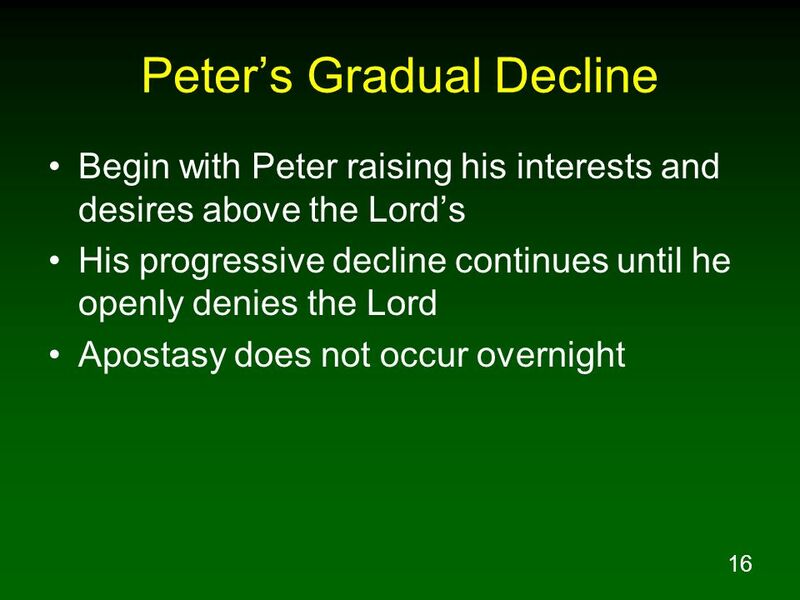 2Pe 1:15 And I will also be diligent that at any time after my departure you will be able to call these things to mind. 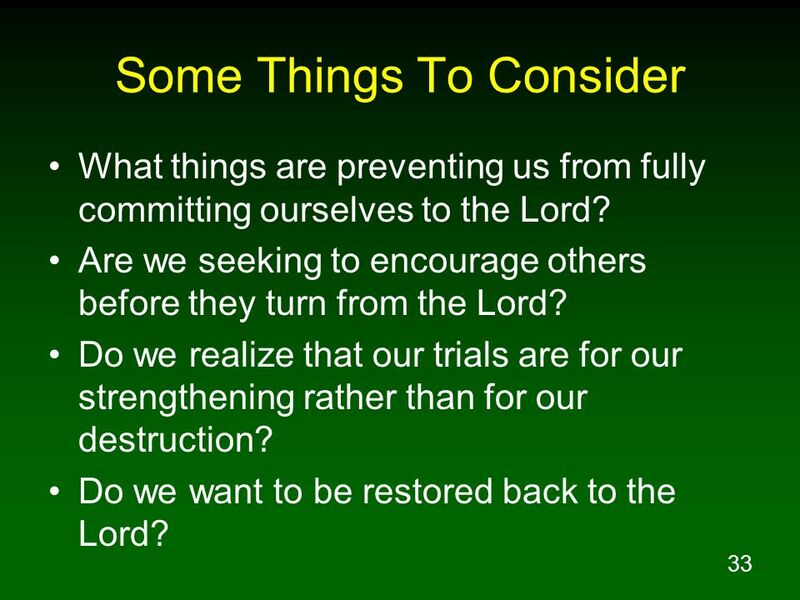 What things are preventing us from fully committing ourselves to the Lord? Are we seeking to encourage others before they turn from the Lord? Do we realize that our trials are for our strengthening rather than for our destruction? 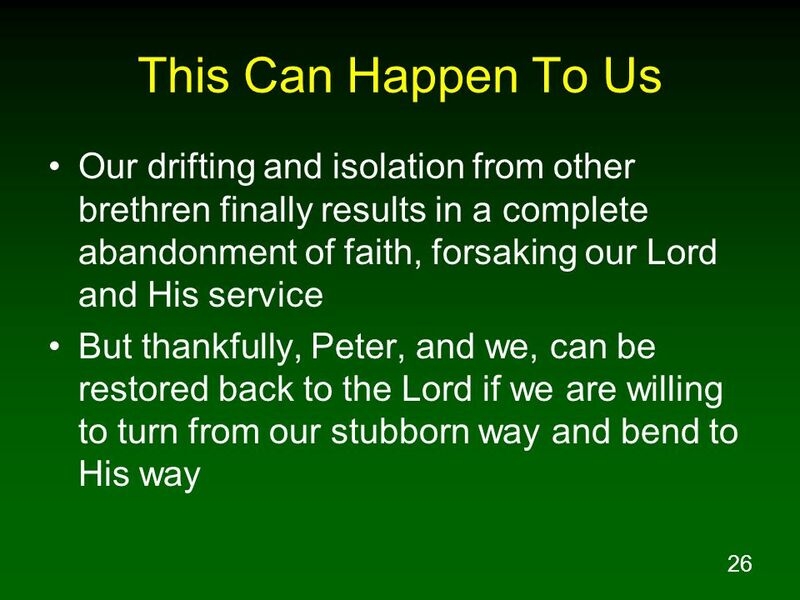 Do we want to be restored back to the Lord? 1Jn 1:9 If we confess our sins, He is faithful and righteous to forgive us our sins and to cleanse us from all unrighteousness. 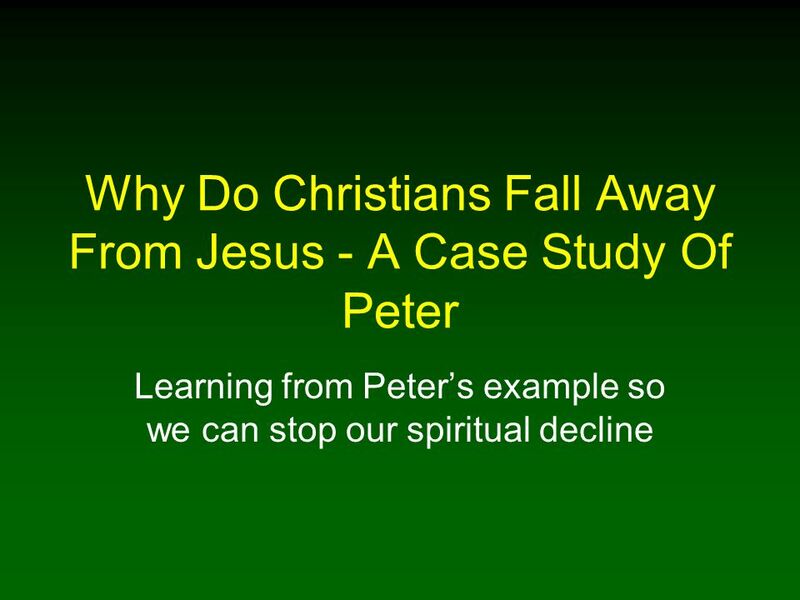 Download ppt "Why Do Christians Fall Away From Jesus - A Case Study Of Peter"
Following Jesus, Part 10. 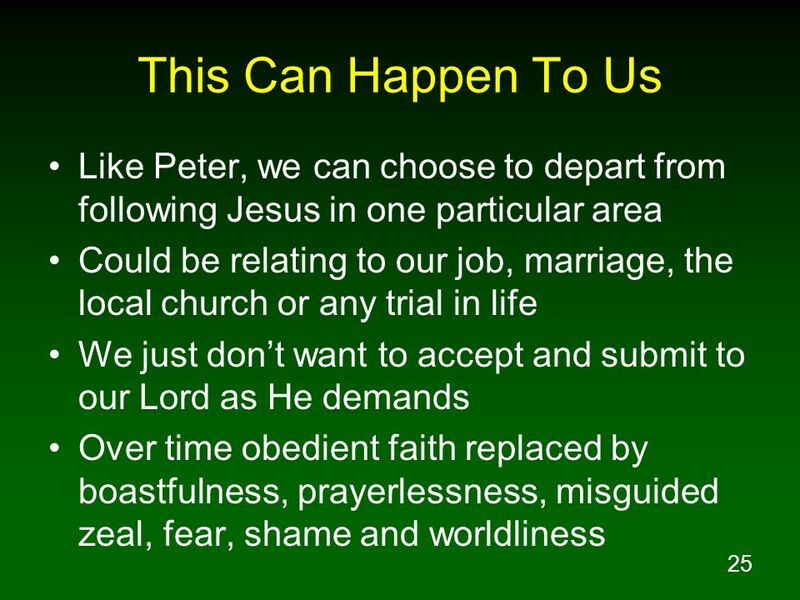 Pray about ONE thing to take to from todays lesson. “It is finished” (John 19:30) Part 6 0f 7. 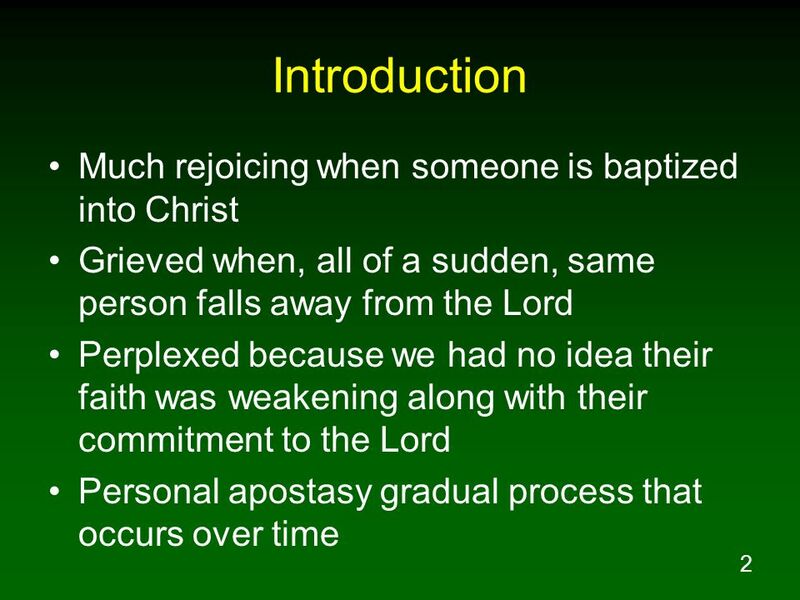 The Benefits of Being a Christian Continued: Victory over Sin Pt 1 Scripture Reading: Rom 6:3-23.